The Richest Man in Assisi: Yes, You Can Do That in Heaven! Yes, You Can Do That in Heaven! 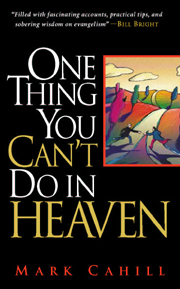 Several years ago, an evangelist named Mark Cahill wrote a book titled, One Think You Can't Do in Heaven. The premise, at least behind the title, is that in Heaven there will be no sinners to whom we can witness about the Gospel, so we better take full advantage of the opportunties we are given here in this life. Since I never read the book, I can't say what his thoughts are on the whole communion of saints thing, but for some reason the idea that we can't lead sinners to God when we're in Heaven came back to me back in October while reading about the arrival of the relic of St. John Vianney's heart in Boston on Cardinal Sean's blog. Guess I'm a little slow bringing these thoughts to paper, but I'm erratic like that. I don't know if any miracles have been confirmed in connection with his relic, but there is still a collection of canes and crutches left behind by people who were healed at the altar to St. Philomena built by St. John Vianney. Of course, every saint has at least two miracles that are verified by the Church to be connected to their intecession. But regardless of miraculous events, simply the presence of a holy relic and the news coverage about it in the Boston area surely served as a reminder to millions that we are all called to radical holiness. I'm sure most of them shrugged it off, but in some people it surely planted a seed and in others a seed previously planted may have come to full bloom. But as if that isn't enough, we have the powerful story of St. Therese of Lisieux. She was hardly known outside of her convent when she died of tuberculosis at age 24. A year later, her autobiography, The Story of a Soul, was published. She became so influential around the world that another nun took her name and became known as Mother Theresa. And in 1997, Pope John Paul II named St. Therese a Doctor of the Church. She is probably one of the best known saints among Catholics for her simple approach to God. Countless miracles are also attributed to her intercession. hmmm... never thought about that before! no indeed haven't spoken to Claire in a while - emailed a few times but when she emails back she forgets to answer questions and to tell me how she's doing!! hehe. I'll be in the US for the summer so will hopefully get to see her!